Model 30 axle is used on all 4WD applications. Cherokee uses Selec-Trac 4WD system. Wrangler uses Command-Trac 4WD system. Grand Cherokee and Grand Wagoneer use a full-time 4WD system. Command-Trac is a part-time system designed for off-road use. Command-Trac uses a vacuum operated axle disconnect mechanism to control 4WD operation. Selec-Trac is a combination part-time/full-time system designed for both highway and off-road use. Transfer case shifter is used to control 4WD operation. Axle build date and manufacturer’s number are stamped on passenger-side axle tube, near housing cover. Axle assembly part number, gear ratio and identification tag are attached to the left side of the housing cover. See AXLE RATIO & IDENTIFICATION table. (1) - Model 30 axle used on all models. front axle components. For information on differential, see 7 1/8", 7 9/16" & 8 1/4" RING GEARS article. Raise and support vehicle under frame. Remove wheels. Raise axle into position while guiding coil springs into position. Connect upper and lower control arms to axle. To complete installation, reverse removal procedure. Mark front drive shaft and axle yoke for reassembly. axle. Disconnect stabilizer bar link bolts at spring brackets. shackles. Lower springs to floor. Remove axle assembly. rotor. Remove cotter pin, lock nut and axle hub nut. shield from steering knuckle. Remove left axle shaft from axle tube. motor housing. See Fig. 1.
collar remains on intermediate shaft. Fig. 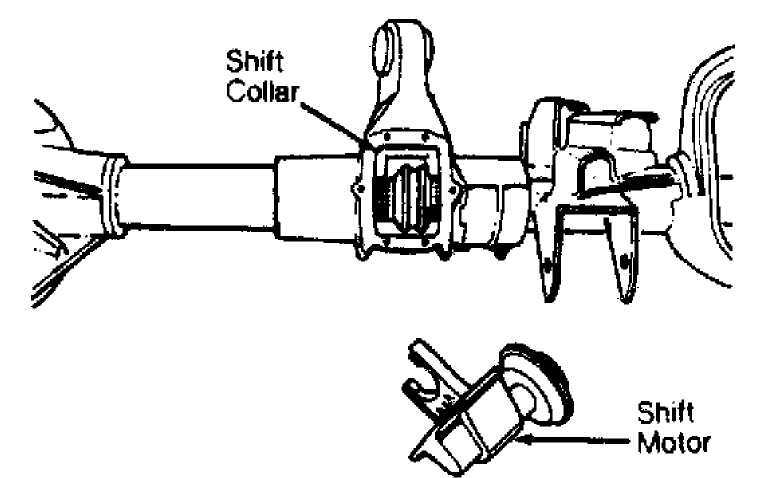 1: Removing Command-Trac Shift Motor Courtesy of Chrysler Corp.
models with Command-Trac, ensure shift collar is correctly positioned on intermediate axle shaft. shift motor. Ensure fork engages with shaft collar. Fig. 2: Removing Intermediate Shaft Retaining Clip Courtesy of Chrysler Corp. Remove outer axle. Remove differential cover and drain fluid. 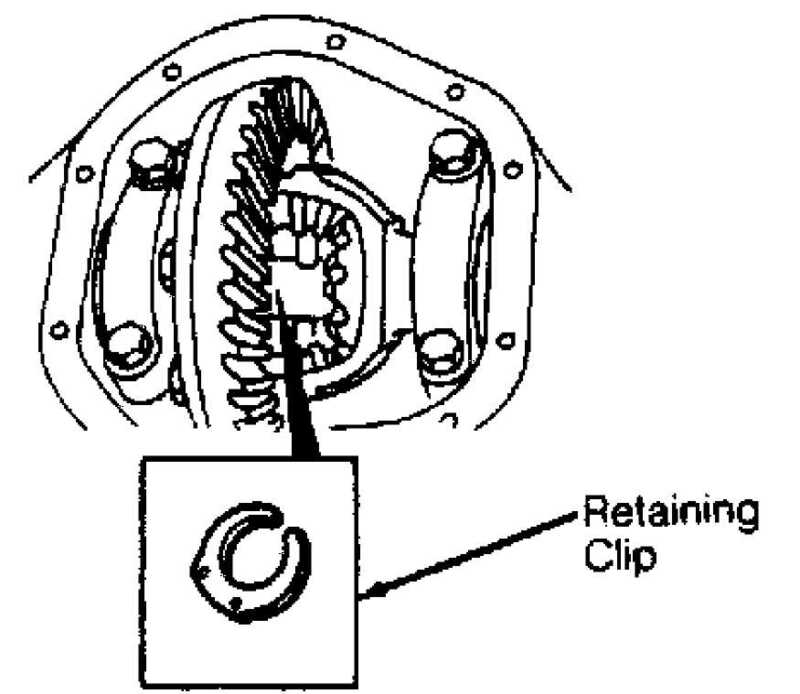 Remove intermediate shaft retaining clip. See Fig. 2. Remove intermediate shaft. To install, reverse removal procedure. Fill differential housing with 2.5 pts. (1.2L) of SAE 75W-90 gear oil. Raise and support vehicle. Remove wheel, caliper and rotor. Remove cotter pin, nut retainer, hub nut and washer. Remove hub-to-knuckle bolts. Remove hub from steering knuckle. See Fig. 3. Apply wheel bearing grease to hub bore in steering knuckle and install hub and bearings. To complete installation, reverse removal procedure. Hub bearings cannot be serviced. If defective, replace complete hub assembly. Fig. 3: Exploded View Of Hub Assembly Courtesy of Chrysler Corp. Remove axle shaft. Remove bearing cap and snap rings. Press out bearings caps from yoke. To install, reverse removal procedure. Pack replacement bearing caps 1/3 full of bearing grease. NOTE: If worn or damaged, assembly. Remove boot clamps. Carefully slide boot down axle shaft. jawed vise. Remove internal circlip and slide CV joint from shaft. and remove hub from cage. Inspect components for wear and damage. and insert balls into hub raceways. Push high side of hub/cage assembly into housing. Ensure assembly rotates freely in housing. Install shaft and circlip. grease. Slide boot over CV joint. Install NEW boot clamps. Check shaft and joint for smooth movement.